A week ago, 7th grade went on a trip to a place in nagano, in a mountain range, named Northstar. In field studies we did many bonding activities which helped us develop our community and listening skills. The whole point of field studies was to bond us more and also to help us solve problems and challenges. I think field studies relates to this because we have to live together in rooms with people who we might not know so well. This may create problems like, who gets what spot and at what time some people want to sleep and at what time other want to sleep. In field studies, we were gonna have to stick with each other for 5 days straight so it was best to just resolve the issues and move on. I think most groups succeeded in doing that. This was one of the activities which we did. 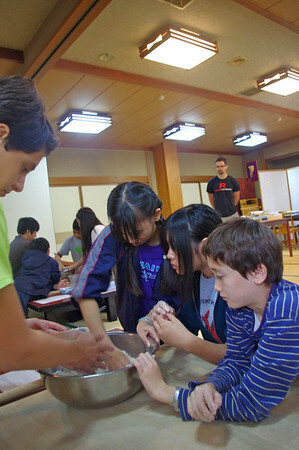 The activity was soba making, in the activity there were many steps and it was a difficult process. This entry was posted in Tutor 7. Bookmark the permalink.